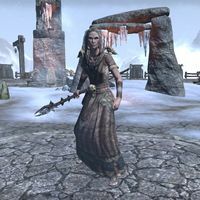 Drodda of Icereach is a Nord witch who took control of Direfrost Keep many years ago from the family of witchhunters who owned it. A basic attack that does moderate frost damage. This attack is untauntable and the boss will attack anyone at will. The boss channels a beam that stuns a random player doing high magic damage over time. This skill will also heal the boss for very large amounts over time. Players shouls break free as soon as possible to avoid damage, and to stop the boss from healing. The boss teleports over to a random player and channels a large explosion around her as indicated by a red circle. This attack does very high frost damage and should be avoided at all costs. The boss summons two Ice Wraiths to attack the party. These should be killed quickly to simplify the fight. As the fight progresses, obelisks around the arena will light up. If the party takes too long to kill the boss, the boss will transition into the next phase once all the obelisks are lit up. In the frost phase, the boss does more damage and her attacks are upgraded. This attack now does more frost damage and will hit anyone in front of the boss. Similarly, it is untauntable as before. The boss summons two Frost Atronachs to attack the party. These should be killed quickly to simplify the fight. Nobles' Rest: Release an ancient fortress from the grasp of a witch. Pledge: Direfrost Keep: Prove you are truly Undaunted by clearing Direfrost Keep. "Your frozen souls will haunt this place forever!" "The chill of Icereach flows through my veins!" This page was last modified on 12 December 2017, at 10:32.